Summary: A new sensor could help to reveal the role dopamine plays in learning and emotion. Dopamine is one of the many neurotransmitters that neurons in the brain use to communicate with each other. Previous systems for measuring these neurotransmitters have been limited in how long they provide accurate readings and how much of the brain they can cover. The new MIT device, an array of tiny carbon electrodes, overcomes both of those obstacles. Until now, neuroscientists have used carbon electrodes with a shaft diameter of about 100 microns to measure dopamine in the brain. However, these can only be used reliably for about a day because they produce scar tissue that interferes with the electrodes’ ability to interact with dopamine, and other types of interfering films can also form on the electrode surface over time. Furthermore, there is only about a 50 percent chance that a single electrode will end up in a spot where there is any measurable dopamine, Schwerdt says. Until now, neuroscientists have used carbon electrodes with a shaft diameter of about 100 microns to measure dopamine in the brain. NeuroscienceNews.com image is adapted from the MIT press release. Funding: The research was funded by the National Institutes of Health, the National Institute of Biomedical Imaging and Bioengineering, and the National Institute of Neurological Disorders and Stroke. Image Source: NeuroscienceNews.com image is adapted from the MIT press release. MIT “Tracking Dopamine in the Brain.” NeuroscienceNews. NeuroscienceNews, 3 March 2017. MIT “Tracking Dopamine in the Brain.” http://neurosciencenews.com/dopamine-sensor-neuroscience-6192/ (accessed March 3, 2017). Dysregulation of neurochemicals, in particular, dopamine, is epitomized in numerous debilitating disorders that impair normal movement and mood aspects of our everyday behavior. Neurochemical transmission is a neuron-specific process, and further exhibits region-specific signaling in the brain. Tools are needed to monitor the heterogeneous spatiotemporal dynamics of dopamine neurotransmission without compromising the physiological processes of the neuronal environment. We developed neurochemical probes that are ten times smaller than any existing dopamine sensor, based on the size of the entire implanted shaft and its sensing tip. The microfabricated probe occupies a spatial footprint (9 μm) coordinate with the average size of individual neuronal cells (∼10 μm). These cellular-scale probes were shown to reduce inflammatory response of the implanted brain tissue environment. 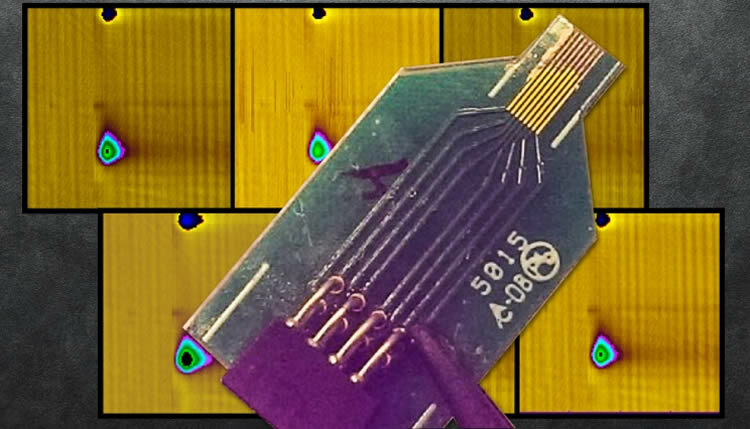 The probes are further configured in the form of a microarray to permit electrochemical sampling of dopamine and other neurotransmitters at unprecedented spatial densities and distributions. Dopamine recording was performed concurrently from up to 16 sites in the striatum of rats, revealing a remarkable spatiotemporal contrast in dopamine transmission as well as site-specific pharmacological modulation. Collectively, the reported platform endeavors to enable high density mapping of the chemical messengers fundamentally involved in neuronal communication through the use of minimally invasive probes that help preserve the neuronal viability of the implant environment.